It has been exactly six months since the new head of Uzbekistan took office. Sadness from the death of the first and beloved leader of an independent country has not yet completely left the hearts of Uzbek people. But the expectations of a bright future under the tutelage of the new leader ease the burden of losing the old one. TV and in newspapers are saying only good things about Islam Karimov, while people, it happens, are swearing and cursing “the father of all Uzbeks” for the fall of the living standard, for stagnation and for the lawless tyranny of those who must monitor the enforcement of the law. 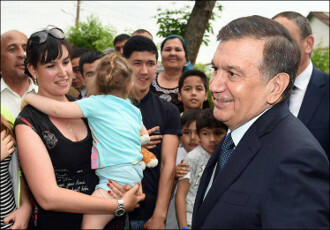 But only hopes for the most positive changes in the country's politics, economy and public life are so far connected with the name of Shavkat Mirziyoyev. The president is the main innovator and reformer of the country. There are vivid calls to change everything, to accelerate, improve and deepen in his speeches. It's too early to argue whether President Mirziyoyev would be able to cure the desperately sick Uzbek economy. Will his initiatives to develop breeding goats and chickens to reduce poverty become a guarantee of the well-being of society? Or will migrants, who will continue to work in Russia and pay taxes at home, rescue their motherland? Or will Gazprom get so much Uzbek gas that every resident of the country will become a millionaire? We shall see. But, perhaps, some visible fruits of his efforts have already been noted today? The most elementary problems are beginning to be solved today in Uzbekistan only when they hear the presidential cry. This is evidenced by letters coming to our editorial office. Here is one of them - from the residents of the district in Tashkent. “President Shavkat Mirziyoyev arrived at our mahalla without warning or invitation. The local residents were surprised: how could he drive? How could he get here? After all, roads in this mahalla have not been repaired for more than thirty-five years! Nevertheless, he arrived very unexpectedly, and first of all - to our local surgery. He entered there and... The surgery is in a critical condition, the panels in the corridors are torn off and stand next to broken chairs and sofas, where patients should sit. “Free of charge” signs are around, but doctors almost openly take bribes. There is no children's unit, parents with babies are standing in the queue for vaccination near the first cabinet (there is a separate entrance for children in other countries), and adults, children, ill patients, and healthy ones pass them. Previously and at present the economy of Uzbekistan has been managed in a completely manual mode. As a matter of fact, the President individually makes the most important decisions, issues decrees, defines major directions of development. In parallel, “he goes to the people”: he travels around the mahallas and inspires local citizens with his authority, influence, and charisma. So it was during the rule of Islam Karimov, so everything remains under President Mirziyoyev. New names emerge, but the internal system of functioning of the state does not change; the rules of the real Uzbek political economy remain the same. Its essence is as follows. There is an authoritarian leader, who under the proposed conditions, can only play a democrat having the authority to repair the sewage system in a single district and thereby earning himself the votes of a silent electorate. There is an inner circle of his relatives and business partners who earn on “proximity to the body” of the king. There are law enforcement structures that are dissolved among the people and voluntarily extinguish any positive energies. There is a lower circle eating scraps from the master's table, and happy with the fact that the leader drove into their very mahalla instantly solving all the old problems of a single quarter. The Uzbek society is divided, shapeless, passive, depoliticised and constantly hopes for a “good king-father.” As long as it exists in such a state, no major “reforms” in Uzbekistan are liveable. Sewerage will be repaired only in the neighbourhoods that the President personally visits; most of his loud statements will not be realised; the fervour of the “reformer” will eventually fade to nothing. And the neighbouring mahalla will wait and wait for mercy from the monarch.